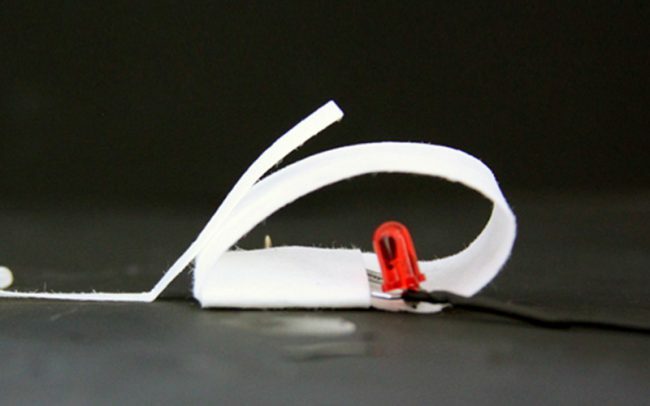 Cirquids is a novel manufacturing method for building paper-based circuit boards in a quick, sustainable and inexpensive way. 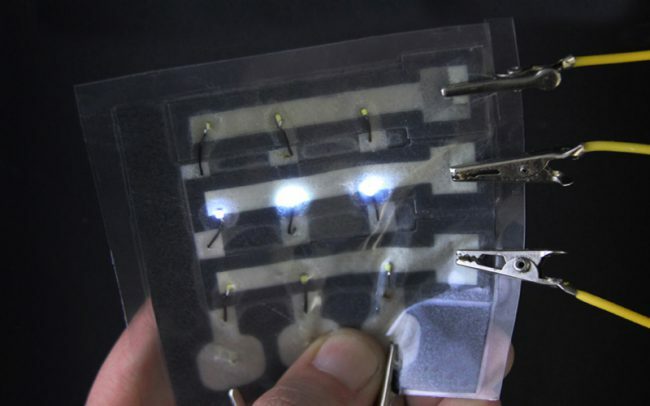 Circuits that have been created by this method show a fluid and temporary state of being conductive and therefore enhance the concept of paper-based circuits and paper-based electronics. The method and idea was developed during my bachelor thesis at KISD and needs to be explored further on. 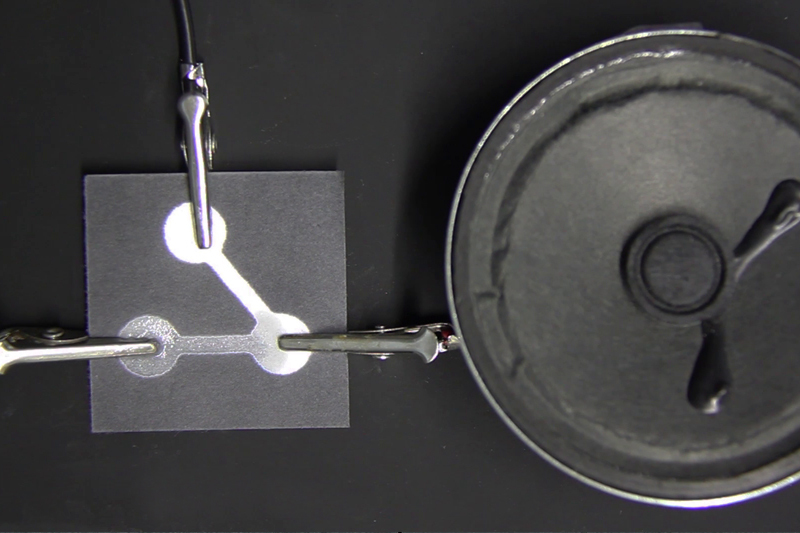 Taking advantage of paper’s intrinsic ability to absorb and store liquids, a conductive suspension can be applied to it to establish a conductivity. In my work I focused on using a suspension based on salt and water, as I found its simplicity, high opacity within the paper and its slow vaporization-process at room temperature most intriguing and fascinating. 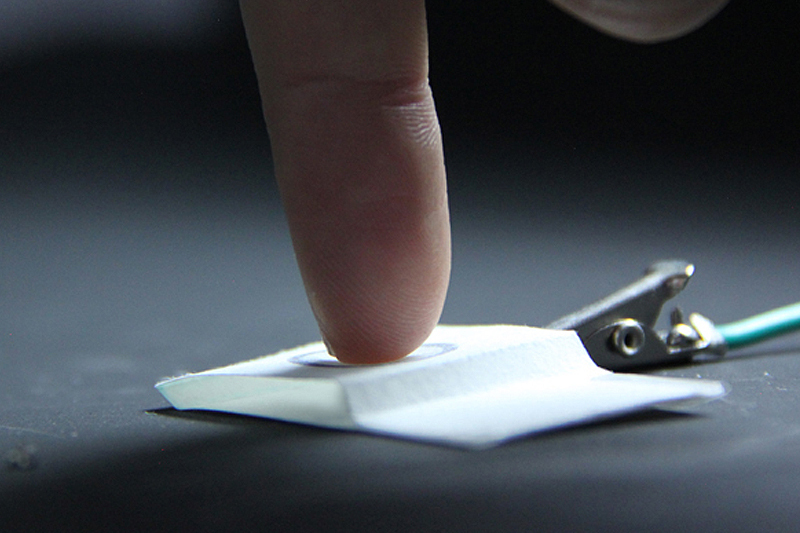 The shape of such a conductive path can be de terminated by printed a hydrophobic wax barrier in advance, which will regulated the liquid’s spreading within the paper’s fibres. Thus, a temporary and fluid conductive path can be created. To distinguish this special kind of circuits from common rather static and non fluid circuit paths I will refer to them as “Cirquids”. To insure an area-covering hydrophobicity within the paper, the wax should be heated up, so it can sink through the entire layers of fibres. By attaching electronic elements to the printed Cirquids, various paper-based devices can be built. 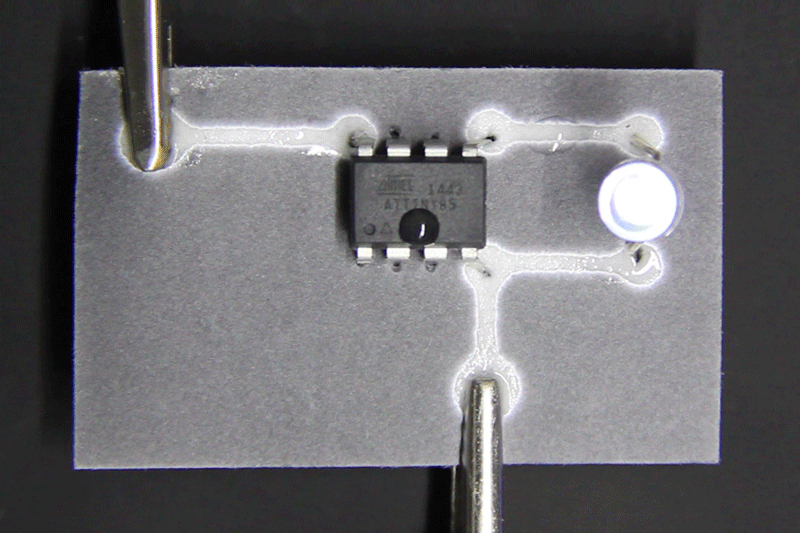 This offers the possibility to print and experience/test individual circuitboard-layouts without using metal-based substrates or having to use and buy special hardware or various chemicals for manufacturing printed-circuit-boards via etching methods. To test the and explore the limits of my Cirquids, I integrated various kinds of electronics to explore, demonstrate and reflect on its potentials. 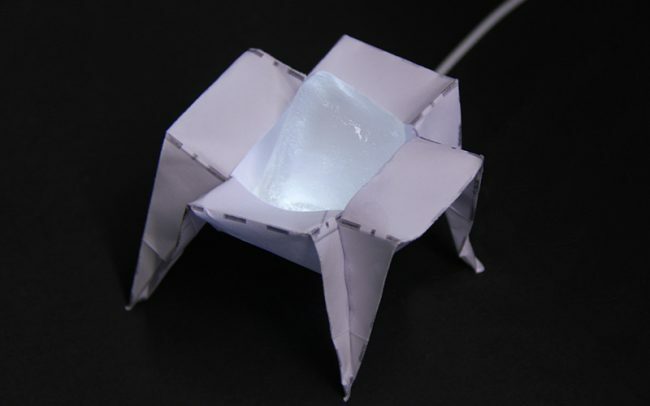 While printing paper-based circuits normally requires the usage of silver- or copper-based materials, Cirquids uses approachable and rather sustainable materials: Wax, Salt and water. This can drastically simplify the rapid prototyping process for flexible electronics and makes it more accessible for a larger group of people. In my work, I focused on three possible printing methods: Using a Solid Ink Printer, working with screen printing or drawing the Cirquids by hand. I mostly used a solid ink printer, as the circuit’s layout is created via graphic- and vector-based computer software and shows a high adjustability. The parameters of a printed wax-motive can be influenced easily due to the printer’s soft- and hardware. The amount of applied wax for example can be regulated by a line’s stroke-intensity or the chosen CMYK-values of the printed line. 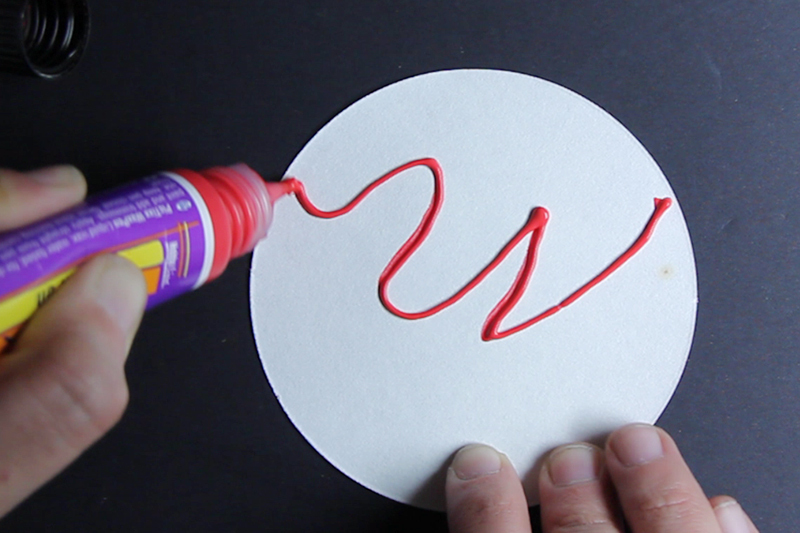 If you want to draw and define Cirquids on paper in a more intuitive and maybe also affordable way, I explored the technique of simply drawing the wax by using a wax pen, which is normally used for decorating candles. 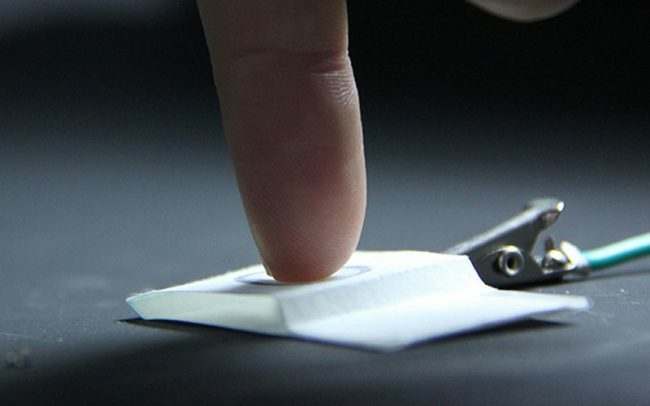 A great and inexpensive method for rapid prototyping purposes that can be quite communicative if used during a designing process in a group of designers or engineers. However, it must be considered that this method results in a rather low resolution and in general it shows a lack of precision due to the skills of the person drawing the Cirquids as well, as the used wax shows a greater deal of expansion during the necessary step of being heated up. Yet another and even more promising aspect is Cirquids’ potential to redesign and rethink the established mechanics and shapes of electronic devices. 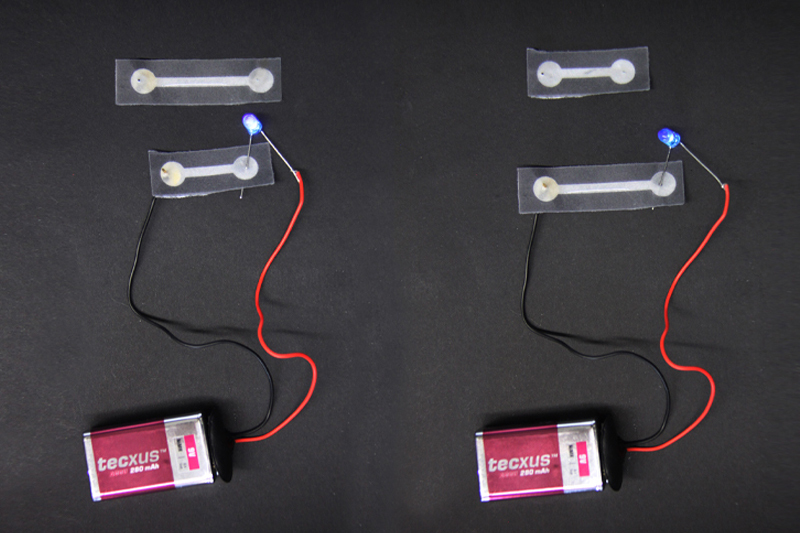 If you compare the two shown potentiometer-types (below) it is obvious that the adaption of a common slider potentiometer does not fit to the paper’s properties and the squeezable potentiometer shows much more potential, especially when thinking about a rich interaction. 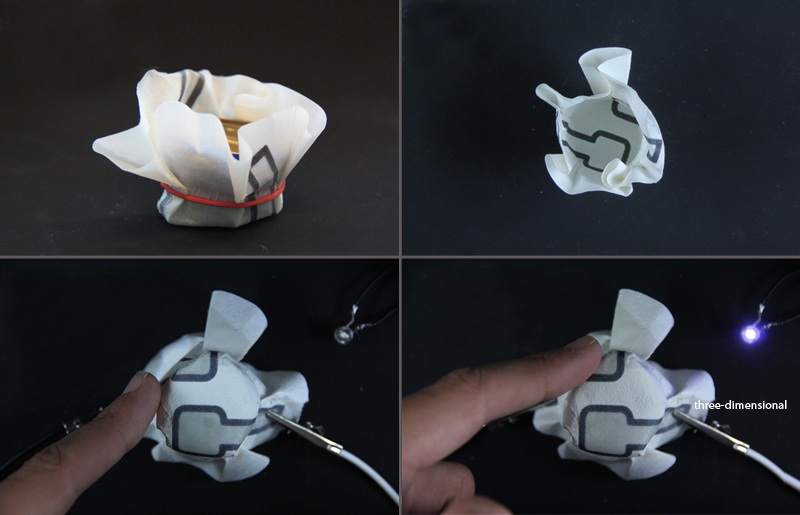 Cirquids enables rapidly prototyping various novel shaped electronics by considering the material’s specific properties or its reaction towards external forces; to enhance the gestalt of electronics and explore new interaction forms. 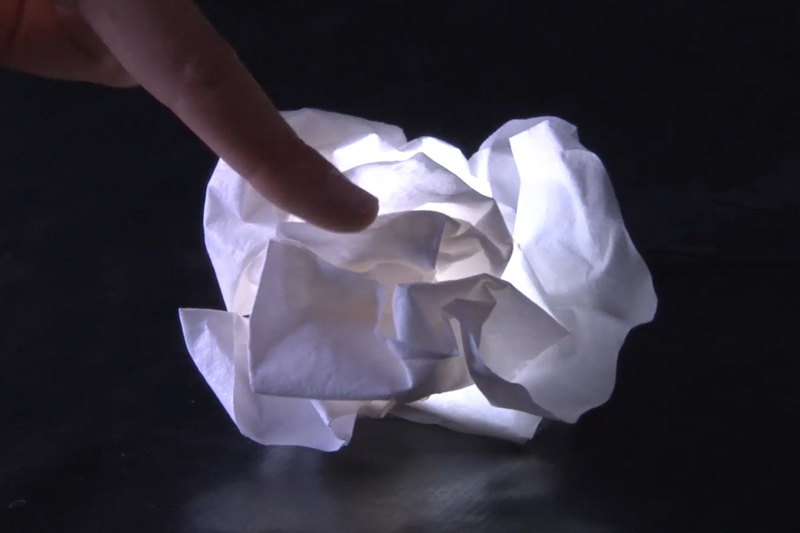 By wrapping a wetted paper with imprinted Cirquids around an object. 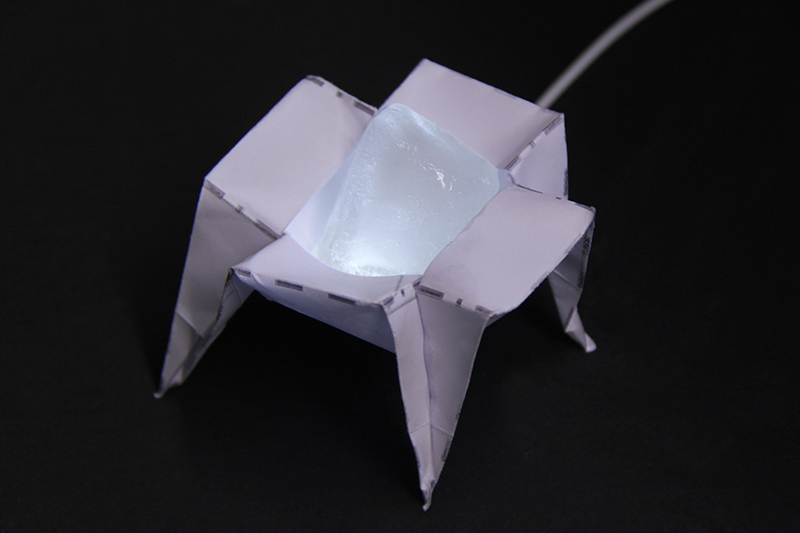 It will adapt the object’s form and will feature characteristic shapes of a deformed sheet of paper after remaining dry again. 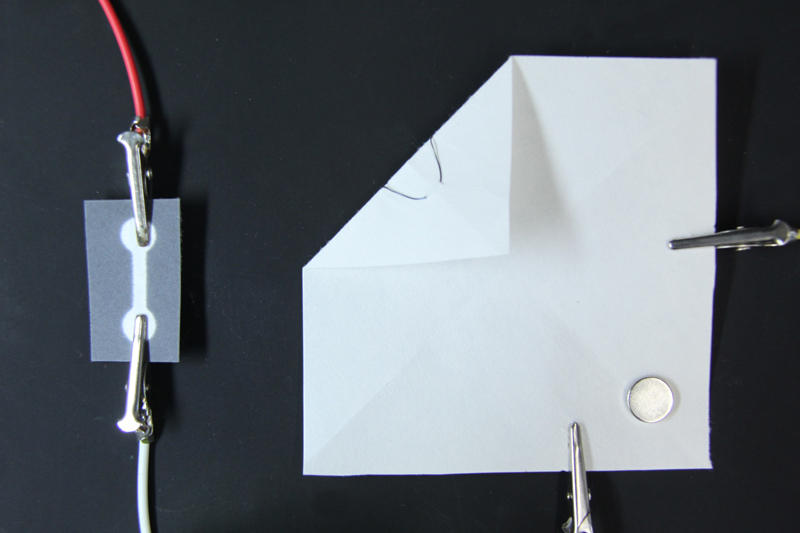 Also, the imprinted Cirquids will form a three-dimensional circuit-structure along the complex shaped paper-structure. Building such a device with a plastic-based substrate for example would require more complex manufacturing techniques. 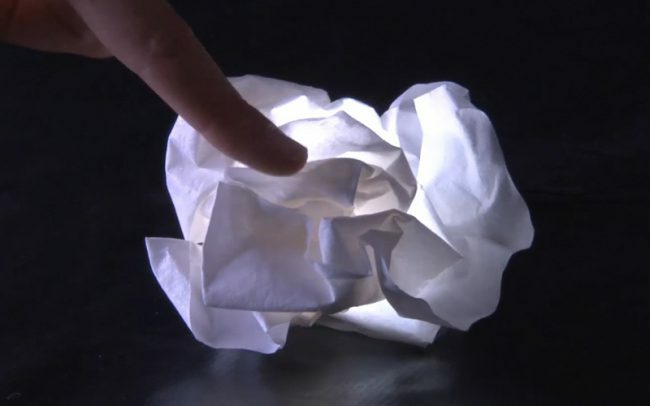 Also, using conductive ink instead could cause severe damage to the circuits-structure duo to the process of being bended and crumbled around, as it is more like a coating on the paper’s surface. Printing a circuits-board on paper for building a low-tech display that is based on an LED matrix, commonly involves many working steps. The steps can be drastically simplified by using Cirquids instead. There is no need of using specific chemicals for etching a plastic-based PCB or connecting the high amount of LEDs and their wires onto the printed PCB traces via numerous soldering steps. 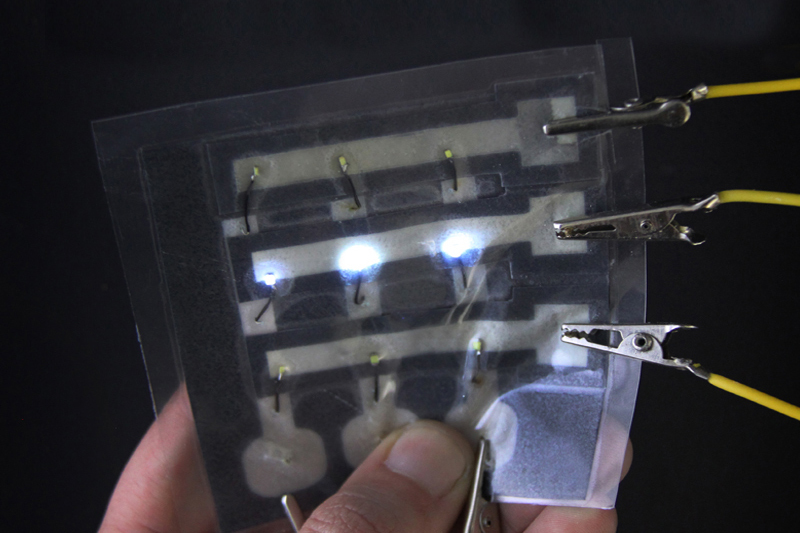 Instead, printing two layers of paper-circuits, separating unwanted touch points with a non-conductive material (transparent tape) and pinning the LED pins directly into the layered paper is necessary to built a low-tech Display. Another intriguing potential of Cirquids is its fluid and evanescent state. Designers can consider the duration that is needed for the liquid to spread through the paper and the pre-defined pathways. 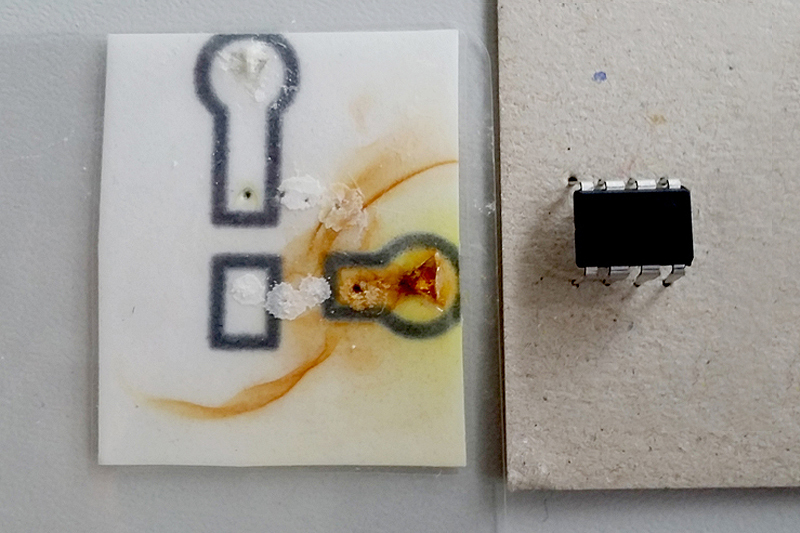 As well, als the contamination with salt water or another conductive liquid may be used to trigger the circuit to emerge and vanish after a certain amount of time. 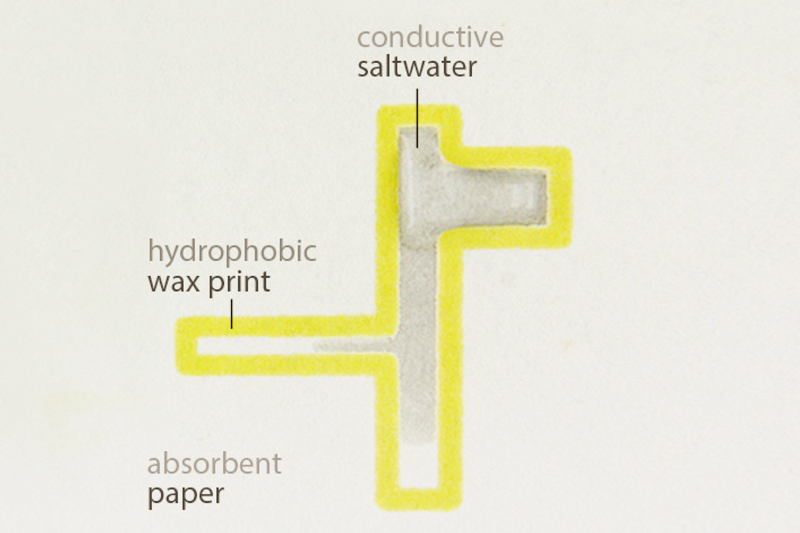 he circuit-layout, the way of applying salt water and the paper’s qualities can be used to influence the duration. Detecting the wetness of a certain area within the paper for example can be used to trigger programmed operations. 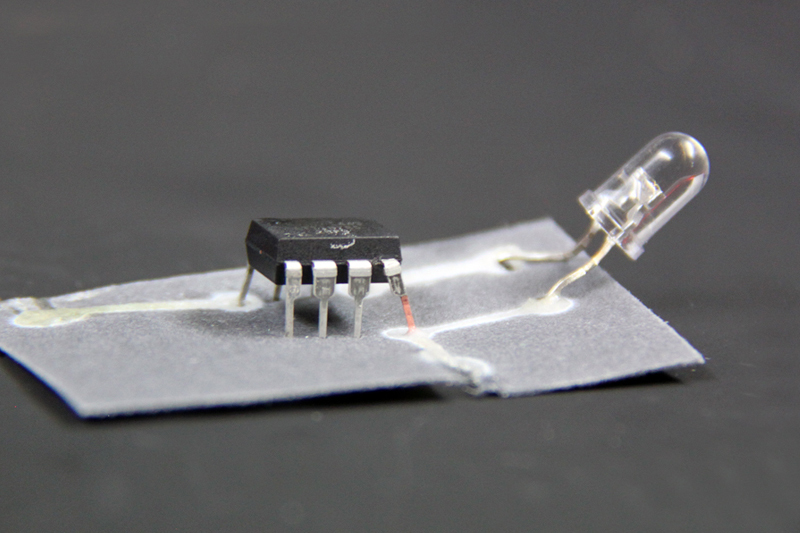 In this case, its capillarity can be used as a moisture-sensor which detects the spreading of the conductive liquid within the paper. If the liquid passes through and reaches a certain area, one or more sounds can be played. If you want a circuit to stay active for a specific period of time for example, you could place a salt-water-icecube on top of the the paper, which will provide watering the Cirquids with the needed salt water until it has been melted completely. The lifespan of the Cirquid can be defined by the size of the ice cube. 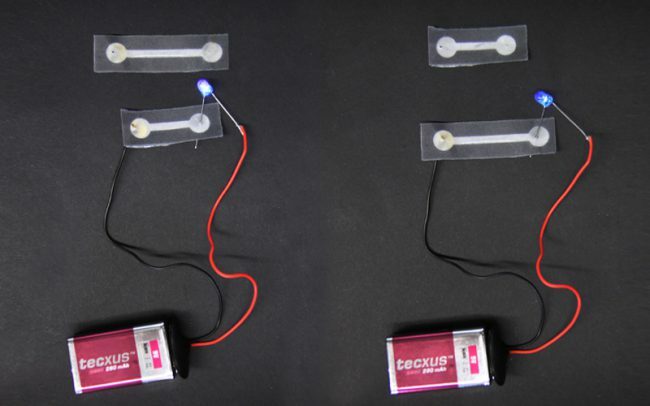 Combining two components, which are more likely to be kept away from each other, like water and electronics opens novel ways of regulating a circuit with the help of the materials ability and conditions. 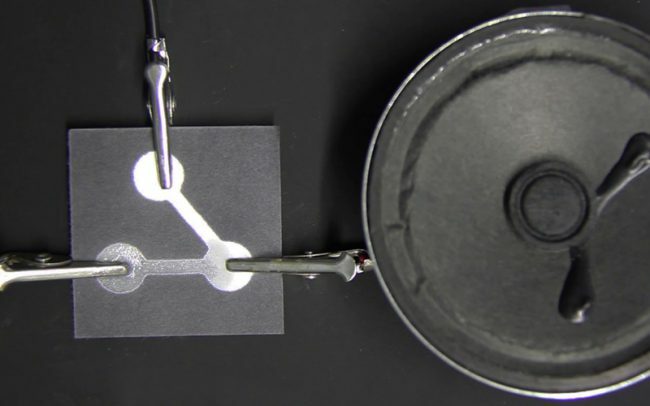 As the combination of a salt-water suspension and integrated metal-based electronics results in another interesting phenomena. Especially by applying a current above 5 Voltage, the current flow will leave colourful traces behind. When thinking about the life-span of an electronic product this phenomena is illustrating question like: when should a products cease to exist? How can a rather invisible status, like having a current flow running through an object, leave a trace behind within the material? Or: How can a circuit decompose itself and resolve itself?